The very last day Preston will ever be a first grader! It's here! Olivia might be a little pumped up for summer and Preston being home all day every day. She did not want him to go into school. Raced over to give him one last tear filled hug. Notice the backpack. My girl needed to be just like big brother on the last day of school. Including the last day of school photos on the fence. She was much more cooperative than Preston was. What can I say me and Preston, we aren't morning people! It's almost over! The end of first grade! Of course I showed up early to make Preston smile and take photos with everyone. Do you expect anything less of me? Preston and Addi! Two years of pre-k, a year of kinder, and now a year of first grade all together! Friends! They were all being so cute wanting to pose and smile for all the photos! Even Preston was feeling it! Me and my boy! I can't believe we're done with first grade! Can you tell they were all just a little bit excited? It was kind of absolutely adorable! Preston and his first grade teacher, Ms Bronson! The walk home! Preston and James! He did it! Officially not a first grader anymore! Sob! Notice the excitement? Pretty sure that he was way more excited for all of these end of first grade photos than he was for all of the start of first grade photos! Also the white piece of paper is because I go back in later and add the "Last Day Of First Grade" portion because then I don't have to worry about glare or it being upside down. Live and learn! My favorite boy! For how hard he pushes and how quick he loves, I love him with everything I've got! 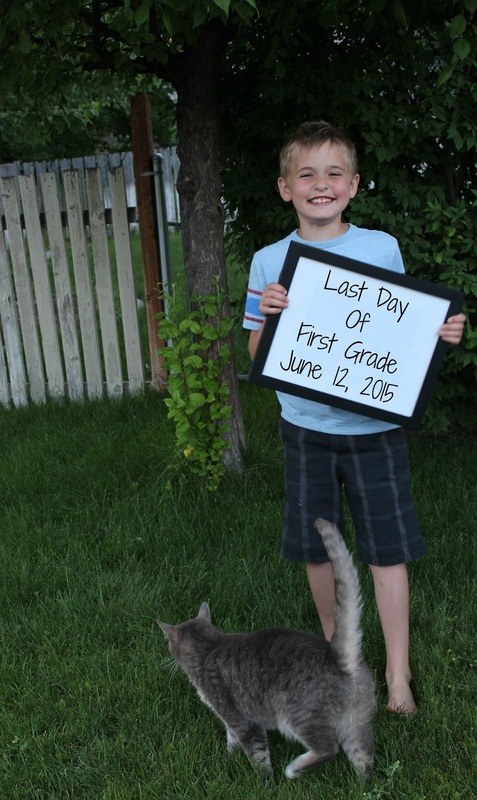 He's going to be a second grader!